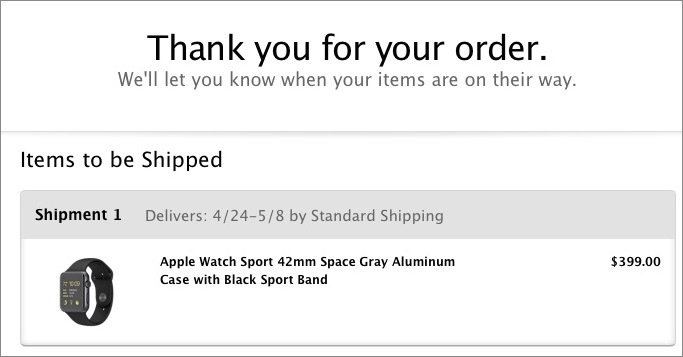 It continued to show the delivery date range of 4/24-5/8, even after the initial date of 4/24 had passed. That was somewhat distressing because it implied that the system wasn’t even bothering to track the order status but just displaying a canned status report. This was no longer distressing, but it was annoying, because the earliest possible date in the date range had already passed, so it just seemed like a bit of programmatic incompetence. The correct thing for the order system to do once the initial date in the delivery range has passed is simply not to include the first date in the range. Rather, it should say, in the case of the second status form shown above, that delivery will take place “by 5/8”. Including the original date in the range is useless information. Update: Of course, this makes it all better. This entry was posted in Opinion, Technology and tagged Apple, user experience. Bookmark the permalink.